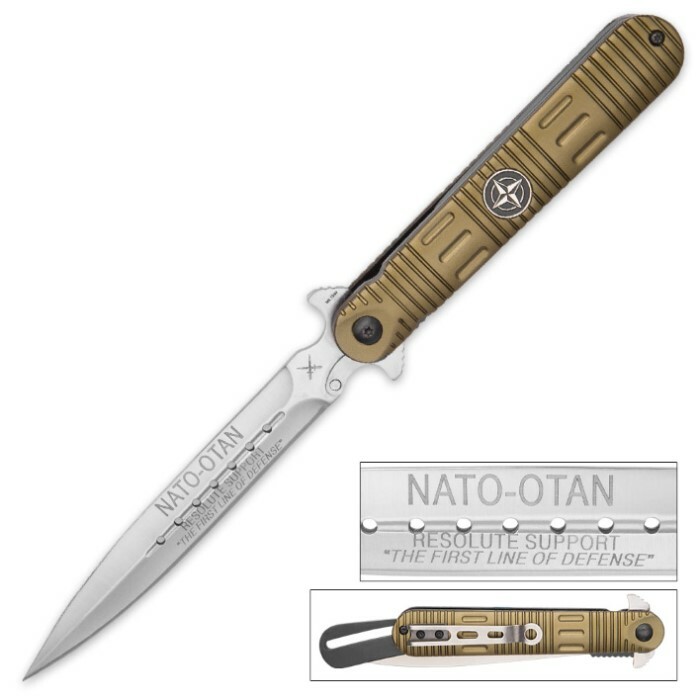 NATO Stiletto Knife - Army Green | BUDK.com - Knives & Swords At The Lowest Prices! Our NATO Stiletto is one extraordinary knife! 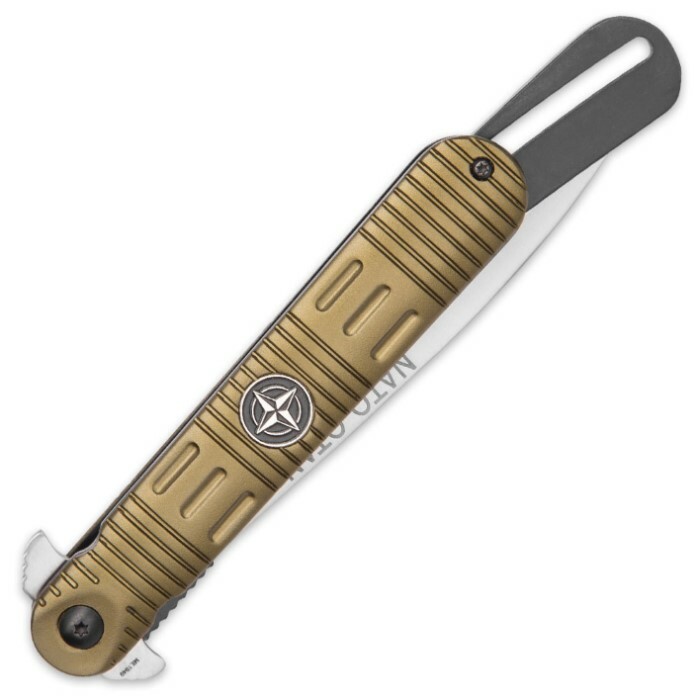 The slim 5" stainless steel blade is clearly longer than the handle and it features NATO themed etchings with the words, “Resolute Support: The First Line of Defense”. Thanks to an ingenious technology, the knife can be handled in the closed position, despite the unusual proportions. The blade protection mechanism automatically slides out of the handle when the knife is folded and covers the tip of the blade. The Army green handle is made of aluminum and bears a NATO emblem. 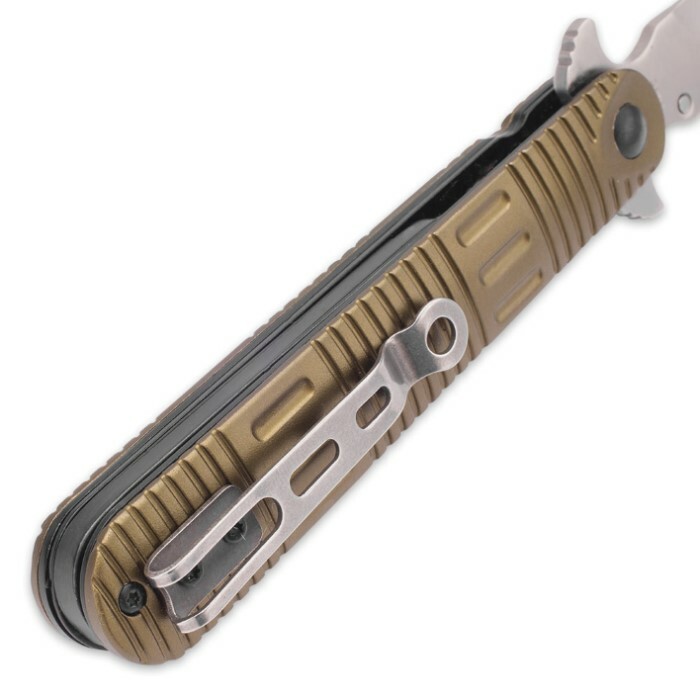 The unique pocket knife also has a liner locking mechanism. In case you didn't get it the first time - this is one extraordinary pocket knife! The knife itself is great! fast opening, nice weight as well! The only issue I have with the knife is that its not exactly straight! Its not too noticeable while showing and handling, it is noticeable, however, when looking straight down the handle to the blade. while only off by about 3-4 degrees, its still something i noticed. Unsure if anyone else had this issue with the knife, but other than that- i love it! BAD TO THE BONE ! Love this knife, it's different from anything I have. Lightning fast assisted opening. Got 2 more to give to friends.